For me, only one chocolate mousse cuts the mustard, a homemade one inspired by our local restaurant, La Môle. 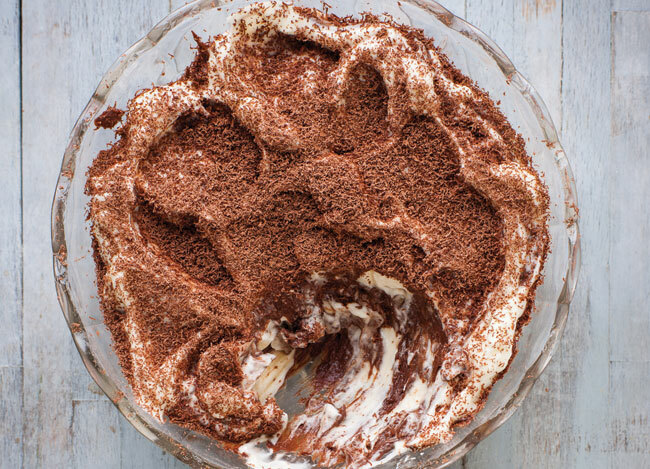 This marbled mousse is a striking dessert to bring to the dinner table in a large glass bowl. ✽ Begin by making a pastry cream: warm the milk in a large saucepan over a medium heat. Whisk together the egg yolks and sugar in a bowl until pale, then stir in the cornflour and cocoa powder. Slowly pour in the warm milk a little at a time until it is all incorporated. Return the mixture to the pan and place over a medium-high heat, whisking constantly to prevent the eggs from curdling. Stir until it thickens and bubbles, then use a spatula to scrape it into a clean bowl. Cover with cling film, touching the surface of the cream to stop a skin forming. Set aside to cool. ✽ Pour the egg whites, lemon juice and salt into a stand mixer and beat to stiff peaks. Continue at a fast speed, slowly adding the icing sugar until glossy. Meanwhile, break the chocolate into a heatproof bowl and set it over a pan of barely simmering water to melt, then remove from the heat. In a separate bowl, whisk the whipping cream until light and fluffy. At this point you should have four bowls of different ingredients. Loosen the pastry cream by stirring with a spatula, and add the liqueur. Stir the melted chocolate into the pastry cream. Clean the spatula and carefully fold the whipped cream into the egg whites. Fold half the white mixture into the chocolate mixture, until completely mixed, taking care not to lose too much air. Put a couple spoonfuls of the chocolate mousse in a serving bowl, followed by a few of the white mixture. Use the spatula to mix and marble everything together. Continue adding and mixing, leaving some unmixed darker and whiter parts all over. Finish with a generous grating of dark chocolate on top. Allow the mousse to set in the fridge for 1 hour before serving. It will keep in the fridge for no more than 2 days.